Executive coaching is aimed at improving the performance of high-powered executives within an organization and is similar to sports coaching for high-performance athletes. The role of the coach is to expose blind spots and challenge the executive to achieve greater levels of success. Everyday, hundreds of executives seek the support and council of independent third-party executive or leadership coaches - often referred to as thinking partners. Unlike middle managers or front-line staff, executives are in a unique position at the top of their organization. Here at Noomii, we help both individuals and corporations get matched with their ideal coach(es). Scroll to the bottom of this page to either browse our directory of executive coaches by zip code or request a call with one of our corporate coaching experts and let us help you find the perfect coach. The benefits of coaching depends on the type of organization and the desired outcome of the coaching. In the case of executive coaching, the company benefits if the executive’s performance is improved by more than the cost of the coaching PLUS any additional improvements experienced throughout the organization based on the executives performance. Let’s say for example, an executive earns $100,000 and the company invests $10,000 per year for their coaching. Can the coaching improve the executive’s performance by 10%, an amount equal to the investment? And what’s the multiple effect? If the executive manages 10 people, how much of their performance is affected by the executive coaching? Ideally, there will be benefits throughout the organization and the return on investment will be much greater than 100%. According to the International Coach Federation Global Coaching Study performed in 2009, the median company return was reported to be 700% with almost one fifth of respondents reporting an ROI of at least 50 times (5000%) the initial investment. There are various ways to calculate the benefits of executive coaching, such as 360 reviews, climate surveys, customer surveys and surveys of sales, costs, employee turnover and other business results. Of course, some results are more "tangible" than others and are easier to translate into a monetary value or bottom-line impact. Of course, that doesn't mean that the tangible benefits outweigh the intangible in terms of importance. In fact, intangible changes in the client's behavior can often have a wider-ranging impact than, or may actually lead to, the more tangible benefits of coaching. 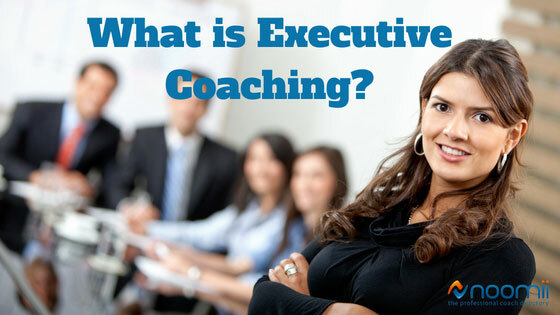 A common misconception about executive coaches ithey are business experts. While many executive coaches possess extensive business knowledge and experience, they need not be experts in your line of business to deliver quality coaching services. A commonly held belief among coaches is that you, the coachee, are the expert in your business. As a result, many executives use their coach as a sounding board, a thinking partner, and an independent third-party who helps them stay focused on the most important parts of the business. In coaching, the learning and the change that people experience is much more impactful and sustainable when the coachee has come up with it on their own – when they discover it from within. In theory, any executive could hire a suitably trained executive coach. In practice that doesn't happen. Most executives want to work with someone who can relate to them, can understand the corporate environment, and has experience in a variety of personal and professional situations. Is Your Employee a Good Candidate for Executive Coaching? How Do I Find an Executive Coach for Myself? The most important thing to remember when looking for an executive coach is to find one whose training, background and skills most closely match your specific goals. There are a ton of coaches with many different specializations and your ultimate success will largely depend on finding the coach with the best “fit” for your particular situation. Because finding the right fit is so important, it’s critical that you not just hire the first coach you talk to. Instead, we recommend you speak with at least 3 (ideally 4 or 5), to find the one who you’re going to feel the most comfortable working with over a period of several months. Almost all professional coaches offer a free 15 or 20 minute consultation to help you determine if they are the right coach for you. If you’re fairly sure about what you’re looking for in a coach, you can find a list of hundreds of coaches with several specializations in Noomii’s directory of professional executive coaches. However, if you’re not sure exactly who you should be coaching with, you can request a coach through our Referral Program. How Do I Find Executive Coaches for a Group of Leaders and Managers in my Organization? We regularly get approached by Human Resource managers, Organizational Development managers, and Procurement specialists within medium to large corporation (100 - 50,000 employees) to find coaches for their executives, managers and high potentials. As the largest network of professional coaches, Noomii is uniquely set-up to deliver a large number and variety of coaches for your people. There are thousands of executive coaches out there, so the process of finding the right match can be daunting. Luckily, our coaching experts at Noomii make the process of finding the best executive coach matches for your leader simple and painless! Our executive coach match specialist will set up a call with you to discuss the details of your coaching needs, such as desired location, educational and professional background and budget. We will then create an outline of your needs for a small selection of executive coaches that includes details such as the number of coaching sessions, the length of the coaching engagement, the budget and other requirements (360 assessments, etc). Once the coaches agree to the terms, Noomii will draft up documents outlining each coach's details for the coaching client to review. They will then set up consultations with the coaches of interest and decide on the best match.